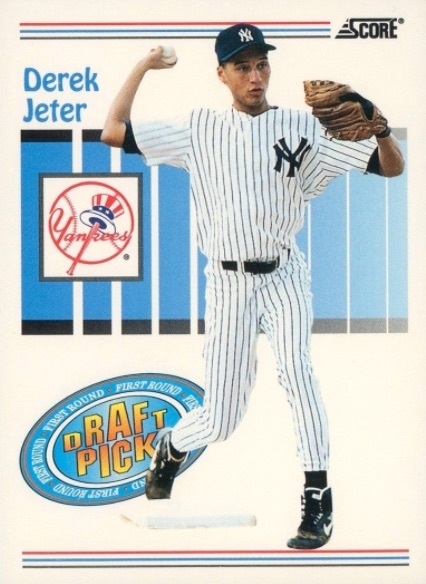 With several to pick from, what is the best Derek Jeter rookie card? Over the course of his career, all have reached a certain level of respectability. 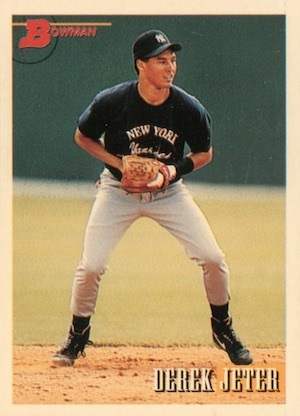 That said, a handful have taken things even further, including the 1993 SP Derek Jeter, which is one of the most sought-after cards of the 1990s. An all-time great for arguably the greatest baseball franchise in history, Derek Jeter is virtually unmatched in the modern hobby. Also helping the case for the superstar shortstop is the fact that he spent his entire career with the New York Yankees, a concept becoming much less common, even for the league's elite players. Shop for Derek Jeter rookie cards on eBay. Excluding parallels, inserts, special issues, and Jeter's minor league cards, there are just eight Derek Jeter rookie cards. We've ranked them all from worst to best. Value was certainly an important part of the criteria, but design and status in the hobby world were also taken into consideration. For a detailed look at key cards from across his career, see our Derek Jeter top list. Click on the card names or images to shop for specific cards on eBay or track values. When Score first burst onto the scene, it was popular simply because the hobby was growing fast and there weren't a lot of options. By the time 1993 rolled around, collectors had many choices and the base brand was losing its way. Simply put, the 1993 Score Derek Jeter doesn't have nearly the same appeal as his other rookies. It starts with the low-end quality but is hurt further by the overly busy design that includes Jeter's name written as though he were a part of The Dukes of Hazzard opening credits. 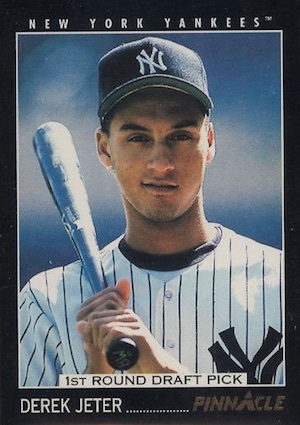 Not surprisingly, this is often the cheapest Derek Jeter rookie card on the market. 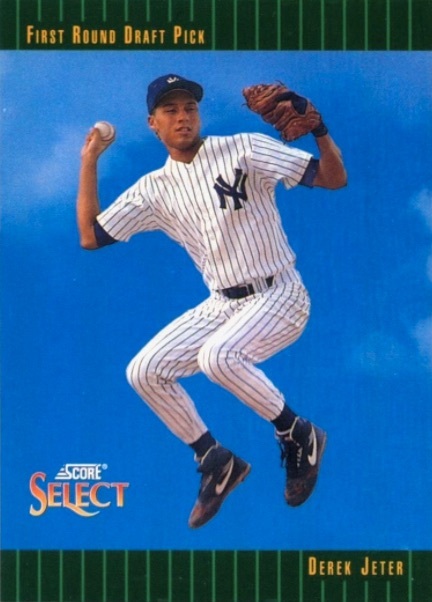 A few years before R. Kelly serenaded us with "I Believe I Can Fly" in Space Jam, Jeter was ready to take off in 1993 Select Baseball. While the cloud-based design certainly stands out, the product didn't reach the same heights. For some, it might be the most fun Derek Jeter rookie card. It's also one of the most affordable. The greatest strength of the 1993 Topps Derek Jeter rookie is that it comes from the most celebrated brand in the hobby. It also kicked off a long-running cardboard legacy between Jeter and flagship Topps. Part of the Draft Picks subset, the card is found in Series 1 packs and boxes of 1993 Topps Baseball. Besides the regular version, there's also a Topps Gold parallel. Even rarer are versions included in special Florida Marlins and Colorado Rockies Inaugural sets. These are essentially the same except they have a special stamp noting each team's debut. The sets were available primarily in the local Colorado and Florida markets and have a relatively low print run. 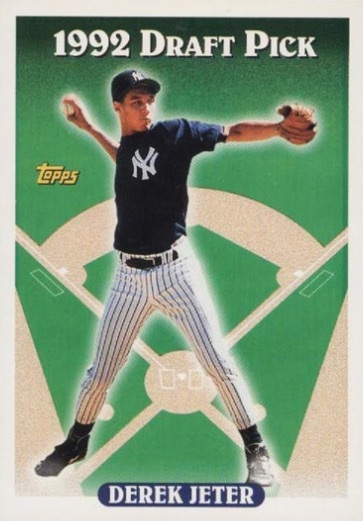 It is important to note that the '93 Topps card for Jeter has been used on various reprints and this will likely continue to be the case as long as Topps opts to recycle classic cards. Like Topps, flagship Upper Deck cards always have a lot of broad appeal. 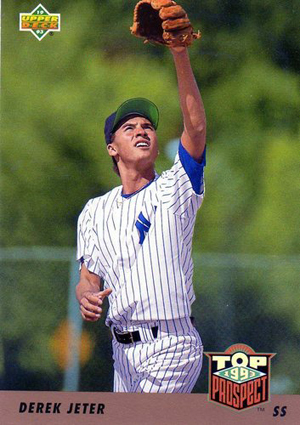 Slightly higher quality than Topps, Jeter is part of the Top Prospects subset. 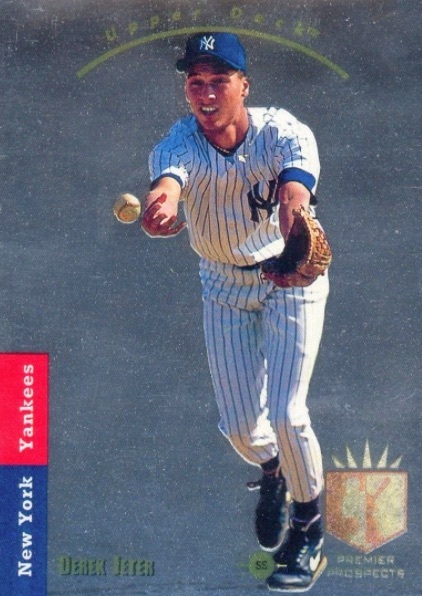 1993 Upper Deck Baseball was released in two series and Jeter's rookie is in the second set. While the basic version is one of the more affordable Derek Jeter rookie cards, there's also a much more limited version that has a gold hologram on the back. Random factory sets were filled with the slight variations but the cards were never in traditional packs. These command significant premiums over the regular 1993 Upper Deck Derek Jeter rookie card. It is tough to follow up on the popular 1992 Bowman Baseball release and its loaded rookie crop. While 1993 Bowman doesn't have nearly the same depth, it does have Jeter. Easily the key card in the set, its place on the secondary market is bolstered by the Bowman brand, which remains a top choice with rookie card collectors and prospectors. At the time, Pinnacle was one of the hobby's premium brands and the 1993 release is noticeably slicker than many of the other Derek Jeter rookie cards. The simple design and portrait also make it one of his most attractive cards. Although it is by no means rare, the black borders are a little tougher for grading. As a result, top-grade versions command a bit of a premium. If you are trying to pull this rookie in packs, look for Pinnacle Series 2 boxes. The 1993 Stadium Club Murphy Derek Jeter is found in a special box set. In recent years it has become very popular, helped by a smaller print run than a lot of his other rookie cards. Collectors may notice the card actually has the same design as 1992 Stadium Club, not 1993. However, because of the set's late release, it's considered by most as a 1993 card. 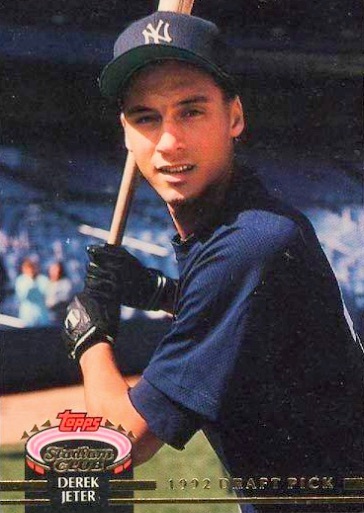 One of the most iconic baseball cards of the 1990s, this is, by far, the most popular Derek Jeter rookie card. It's also the most valuable. Since its debut in 1989, Upper Deck focused on pushing boundaries for high-end cards. 1993 SP Baseball took things to another level. While it's not nearly as premium as it was when Jeter was breaking in with the Yankees, this is an extremely important card from an equally important release. Produced with a foil background, it's notorious for being a tough card to find in top condition. Most come with a noticeable amount of edge or corner wear. As a result, high-grade PSA and BGS 1993 SP Derek Jeter rookie cards can push close to five figures. What's your favorite Derek Jeter rookie card? Let us know in the comments below. 1993 Pinnacle Derek Jeter RC! I have the 1993 SP Derek Jeter RC #279 FOIL card sealed in a plastic case and can not find the value anywhere. As far as I can tell my grandfather either bought it like that or put it in a case (as is all his rookie cards are) as soon as he got it. Other than Beckett website where can I find the value? Stadium Club Murphy my favorite. It is rather odd to me, because he looks like a little kid in that particular photo, like he’s 13 or 14; yet, he’s at the highest peak of the game, and he’s DEREK JETER! Derek jeter 1993 sp foil. I have 1 that i have to have graded and i can almost guarantee it will be gem mint. I have a Derek Jeter 8×10 signature series card. It is in mint condition. The card state its 1 of 5000 and this is number 642 of the first 1000 I’m trying to get an idea of the value , as my husband is trying to decide, whether to sell it or give it to a family member. Thank you for any input you can give me. Love the 1993 Score as it is a vestige to another time s it was non glossy. 1992 Fleer Excel – it’s beautiful and looks vintage. Ungraded, it has been selling in the $80 to $100 range lately.